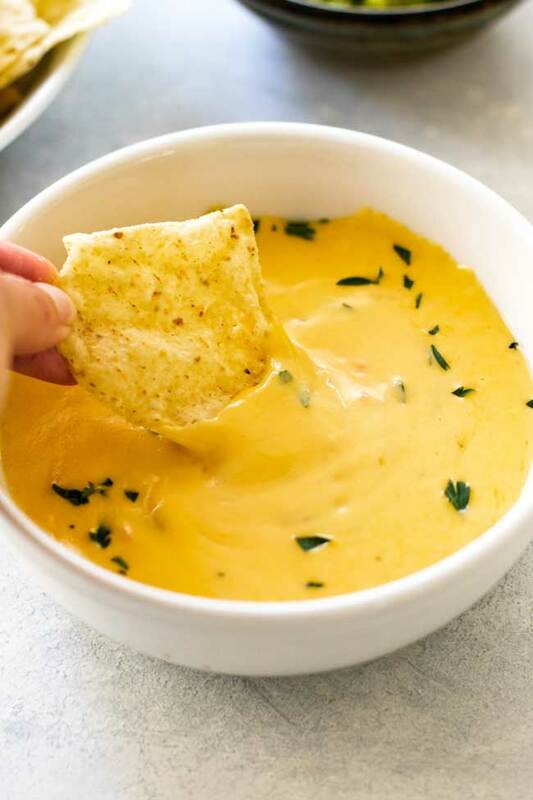 A super easy cheese dip – no stove required! This smooth and creamy dip takes less than 15 minutes to make and calls for just a few simple ingredients. 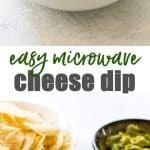 Learn how to make this restaurant-style cheese dip using your microwave, but, beware, this stuff is addicting! A few posts back I shared a recipe for hot roast beef sandwiches with a super simple microwave cheese sauce and I knew it was only a matter of time before I shared an equally easy microwave cheese dip. Goals are good. Meeting those goals is even better and so here we are today with a bowl of creamy, smooth cheese dip otherwise known as tortilla chip’s best friend. 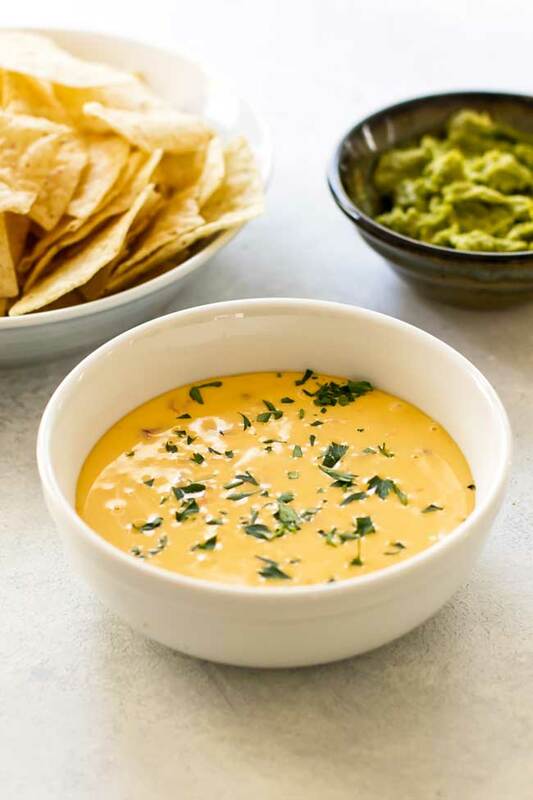 And unlike other recipes I’ve seen for cheese dips, this version uses real cheese – no gelatinous and wobbly blocks of what I like to call “cheese-like” products – with a few other ingredients that, when combined, transform into a smooth and cheesy concoction reminiscent of what you might order alongside your margaritas at the local Mexican cantina. The base of this simple recipe, lightly adapted from Bon Appetit, is made up of three simple ingredients when combined create a smooth and creamy cheese dip. Real mild cheddar cheese and fontina cheese: Be sure to buy blocks of cheese and grate it yourself. The pre-grated stuff sold in bags have additives that can change the consistency of the cheese dip. Cornstarch: Because we’re using real cheese we need a stabilizer, in this case, cornstarch, so that the cheese melts evenly and doesn’t get stringy. Evaporated milk is the other secret ingredient used to create a smooth and creamy dip. It’s more concentrated than regular milk and cream resulting in a smooth and shiny dip. I use a 4-cup Pyrex measuring cup to make this cheese dip, but any microwave-safe bowl that holds at least three cups will work. I like to toss the cheese with the cornstarch in the container until the starch is evenly coating the cheese. I like to add some canned diced tomatoes with green chile (I use Rotel brand), but it’s optional. Place the bowl in the microwave and cook it for one minute. Stop and stir the dip and cook it again for 30 seconds and stir. Continue cooking it in 30-second increments, stopping and stirring each time, until the dip is smooth and creamy. This is a quick 15-minute cheesy treat – add some chips, guacamole, and a margarita and Monday night will feel a whole lot better. 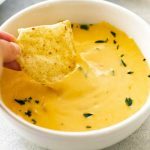 This smooth and creamy cheese dip has real cheese (no wobbly blocks of cheese-product required! ), cooks up in the microwave in just a few minutes, and goes great with some chips and guacamole on the side. In a microwave-safe bowl, combine the fontina, cheddar cheese, salt, and cornstarch. The cornstarch should evenly coat the cheese. Pour the milk into the bowl and add the diced tomatoes with green chile. Place the bowl in the microwave and cook it for 1 minute. Stir the dip and microwave it for another 30 seconds and stir again. Cook it for 30 seconds more and stir it again. At this point, it should be smooth, but if it’s not, continue cooking it for 30-second increments and stirring until it is smooth. Can’t imagine this won’t be delicious. Off to buy cheese and just in time for Cinco de Mayo! Would never have thought of cornstarch to thicken!